For the first time in 15 years the Karen National Liberation Army and the Democratic Karen Buddhist Army stood side-by-side to commemorate their fallen comrades at the 61st anniversary of Karen Martyrs’ Day. The historic event took place on August 12 at an area under the control of the Karen National Union in Kawkariek Township, Karen State. 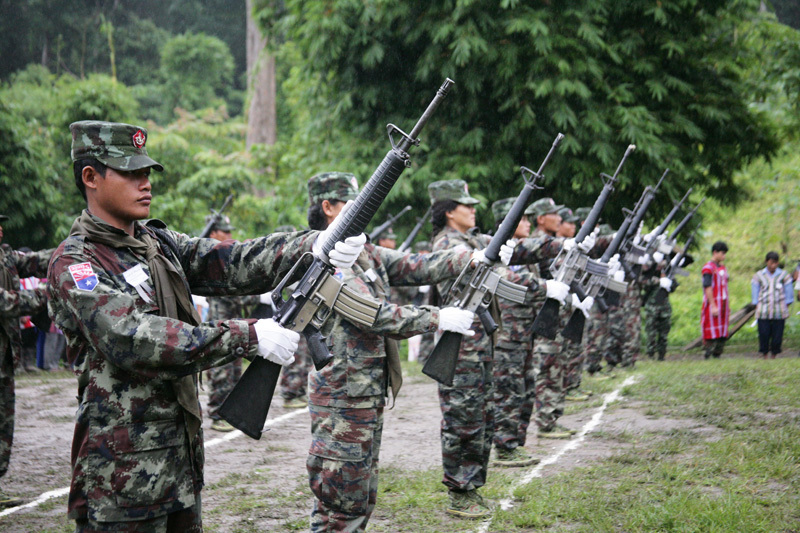 The DKBA broke away from the KNU in 1994 and formed an alliance with the Burma military regime for fifteen years. Over 400 people attended the commemoration service in Kawkariek Township they included both KNLA and DKBA soldiers and their supporters from local villages. Major Saw Kyi Aung, second-in-command of KNLA battalion 201 in Brigade 6 said having the Karen paying respect to their fallen people was good to see. Other joint commemoration ceremonies were held in the KNU Brigade 7 area. Martyrs’ Day was also commemorated with both KNLA soldiers and a breakaway Border Guard Force faction among the participants. According to Major Saw Eh Hser Hser, the office manager of KNU Brigade 7, the commemoration program included speeches on the history of Karen Martyrs’ Day and on Saw Ba U Gyi’s four principles. A member of the renegade Border Guard Force, Sergeant Saw Doh Say, deputy company commander of Battalion 1020, now reformed under their former DKBA flag said it was his first time. KNU president Saw Tamla Baw stated in a letter that the Commemoration of Karen Martyrs’ Day is to honor the sacrifice of Saw Ba Oo Gyi and all the other Karen men and women who gave their lives for their love of the Karen. Saw Tamla Baw’s letter also urged all Karen people to learn from their past experiences and to prevent any division that would hurt the Karen cause. Saw Tamla Baw asked Karen people to continue to fight for the building of a genuine federal union of Burma together with the other ethnic nationalities and democratic forces. Martyrs’ Day commemoration services were also held in local Karen communities and in around the world. The KNU/KNLA Peace Council, led by General Htin Maung held a ceremony at Toh Kaw Koe village in Kawkareik Township, the place where Saw Ba Oo Gyi was martyred when he was assassinated by the Burma military regime.